This article on 'Toilet Leaking at Base' will help you to idendity the cause of your leak and direct you to the resource that will help you fix it. This type of leak occurs when you flush the toilet. Tightening the toilet tee bolts and replacing the wax ring are two ways that this problem can be fixed. Before you head down this path, make sure that the leak is coming from the base. Other parts of the toilet may be leaking and creating water on the floor. Review the troubleshooting section in the article 'Fixing a Leaking Toilet' to locate your problem. For other toilet issues you want to take a look at 'Fixing and Troubleshooting Toilets', this has a complete listing of toilet problems along with solutions. The first precaution would be to stop using the toilet if this is possible. The water that is leaking out of the base of the toilet is dirty water. This is water that has been in the bowl when the toilet is being used. There may be odor as well from this type of leak. You are going to want to use some disinfectant when cleaning up after this type of leak. Is the toilet loose or is it bolted tightly to the floor? If it is loose, there is a good chance that the wax ring is not longer providing the proper seal. 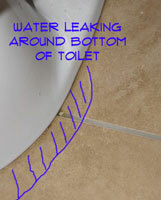 A loose toilet can start to leak around the base. Tightening the toilet may help. There is one warning about the expectations for success with this method. You do want your toilet fastened to the floor securely. The tee bolts that are connected to the toilet flange serve this purpose. A wax ring in compressed between the flange and the base of the toilet, forming a water tight seal. The wax ring is not elastic and will not spring back once it is compressed. With that said, tightening the tee bolts may not stop the leak if the wax ring is not sealing properly. (1) Make sure the toilet is positioned correctly on the floor. (2) Remove the plastic covers from the tee bolts. (3) Use an adjustable wrench, open end or box end wrench to tighten the bolts until the toilet is secure. (4) If the bolts are frozen or they just spin you may need to replace them. See the article 'Replacing Toilet Tee Bolts' for more information. When the seal is broken between the bottom of the toilet and the wax ring, there is little you can do short of replacing it. A failed wax ring will definitely cause a toilet to leak at the base. The good news is that the wax ring only costs a few dollars. The bad news is that you have to remove the toilet to replace it. This is not a five minute repair, instead it may involve a few hours and the need for some help. (1) Purchase a suitable wax ring for your toilet. See the article 'Purchasing a Toilet Wax Ring' for more information on getting the right one. (2) Remove the toilet from the floor and lay on its side. Caution see the article 'Removing a Toilet' before proceeding with this step. The toilet needs to be drain and shut down before removal. Additionally, you may need some help removing the toilet. 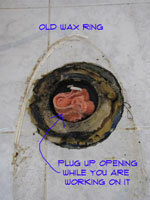 (3) Carefully clean away the old wax ring from the toilet base and the toilet flange. See the article 'Replacing a Toilet Wax Ring' for additional instructions. (4) Replace the toilet tee bolts if they are corroded. See the article 'Replacing Toilet Tee Bolts' for instructions on how to do a better job so they can be loosened in the future. 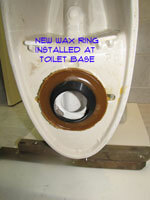 (5) Install the new wax ring on the base of the toilet. Add a filler wax ring for toilet flanges that are depressed below the floor line. See the article 'Replacing a Toilet Wax Ring' for more information. (6) Install the toilet in its original position. You may need some help for this step. See the article 'Installing a Toilet' for additional information. (7) Check for leaks. After the water is turn back on, check the base for leaks. You may want to wait a few days before you caulk the base to make sure that your problem is solved. 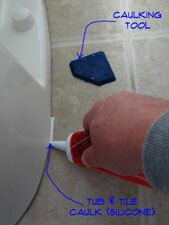 Caulking around the base of the toilet is not a solution for a toilet that is leaking around the bottom. The reason for caulking around the base is to keep water from mopping and other sources from getting under the base of the toilet. Water that is trapped under the base may cause mold and odors that cannot be reached. The caulking will keep the water out on the floor where it can be cleaned up. The leaking toilet bottom should be repaired before caulking is installed. Once you have made the repairs, you can review the article 'Caulking a Toilet Base' for some information on properly sealing the bottom of the toilet. Have you been able to fix the leak at your toilets base? Still have issues? Return to 'How To Fix a Leaking Toilet' for more topics. You can also return to the 'Home Repair Central - Home Page' for additional information.